This 7-night cycling holiday follows Alsace's incredible 'Route des Vins' (wine route), on a linear ride through mediaeval villages and vineyards, between the great Rhine river and the timeless Vosges Mountains. Bordered by Switzerland to the south and Germany to the east, Alsace offers a delicate balance of French and German, which combine to give it its own unique culture and a truly fascinating history. Just a short distance from one of Europe's great modern cities, Strasbourg, you'll discover traditional, unspoilt towns and villages, including several of France's most beautiful: Eguisheim, Kaysersberg and Riquewihr, full of half-timbered houses - painted bright as candy and lifted straight from the pages of a story book. Take your time to visit atmospheric hilltop ruins and fortresses such as the crumbling Chateau St Ulrich and the mighty Haut-Koenigsbourg, once home to great lords, but whose empty halls and towers now watch silently over the fertile plains below. The almost continental weather provides the ideal environment for the area's all-important wine production and this, in turn, gives rise to the wine route that runs the length of the region. At the end of each day you will be rewarded with some of the region's most historic towns. Kaysersberg with its mediaeval streets and old fortress ruins is perfect for a day's exploring. Your home for the night in Selestat is within walking distance from the town centre, with its rich architectural heritage. Your final hotel is the one-time home of the Barons of Gail, tucked away in the centre of historic Obernai, a fascinating town which sits between the vineyards of Alsace and the Vosges mountains. Arrive in Colmar and transfer (25 mins) to the village of Rouffach on Alsace's famous Route des Vins. Set off along the 'Wine Route' through the vineyards, enjoying spectacular views. Stop in beautiful and ancient Eguisheim, officially one of the most beautiful villages in France, and holder of the prestigious 4* ville fleuri award (the highest award) for its town garden planting. Explore the narrow streets before heading on to pretty, mediaeval Turckheim and picking up the Camino de Santiago to Kaysersberg. Spend the day exploring the mediaeval streets and take a stroll up to the ruins of the old fortress. Alternatively, take a taxi to Colmar whose historic old town and riverside 'Petite Venise' area feature half-timbered, half-painted houses, offering a picture of Alsace as it was hundreds of years ago. Highlights today include Riquewihr, still enclosed by its mediaeval walls; Ribeauville, with its Renaissance fountains and hillside ruins (the most impressive being the crumbling Chateau St Ulrich, offering spectacular views) and home to many of the region's best wine producers; and Kintzheim, dominated by the remains of its C13-C15 castle, once property of the Merovingian kings, now home to numerous eagles, falcons and vultures. Explore the mediaeval streets of this one-time Free Imperial City of the Holy Roman Empire, taking in the wonderful architecture, listed buildings and traditional shops, as well as the Selestat Humanist Library - the greatest of its type, one of the three treasures of Alsace and a site inscribed in UNESCO's Memory of the World Register. There is also the option to take a taxi to mighty Haut-Koenigsbourg Castle for a visit along with some unforgettable views. Following tranquil lanes through the vineyards, stop for coffee in pretty, mediaeval Dambach-la-Ville and visit the Chapel of St. Sebastian, parts of which date to C12. For lunch, Barr makes a perfect place to stop, full of impressive half-timbered houses, typically dating from the C16-C18. Take some time to explore the fascinating town of Obernai that sits between the three main features of Alsace; the vineyards, the Vosges mountains and the Alsatian Plains. The town's numerous historic architectural features are well worth investigating but for spectacular views take a ride (perhaps by taxi) up Mount St Odile to Hohenburg Abbey. Morning transfer (5 mins) to the station for your onward journey. 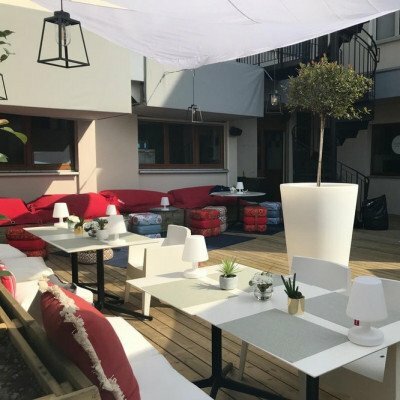 The Hostellerie started life as a C16 staging post but has been transformed into a comfortable hotel with excellent facilities, including a sauna, jacuzzi and an indoor pool, perfect for the modern traveller! The hotel also boasts its own winstub (a traditional Alsatian bar). Each of the 48 rooms has been tastefully decorated with white washed walls and pretty, wooden furniture. 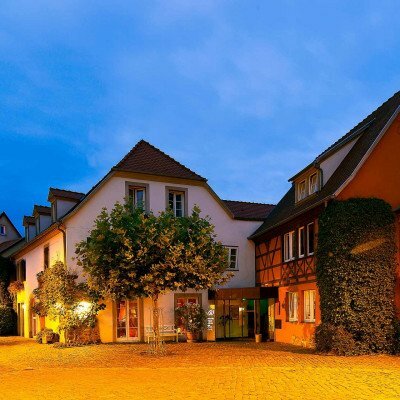 The Hostellerie has an excellent location for exploring this lovely little town, with Rouffach's historic centre just a 10-minute walk away. 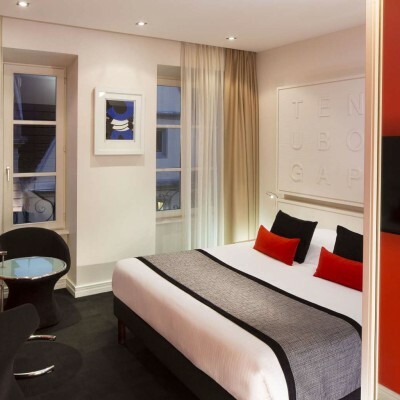 A *** hotel perfectly located within easy walking distance from the town centre of Selestat. There are just 47 modern and comfortable rooms all with air conditioning, cable TV, minibar, safe, hairdryer, plus internet access. There is also a restaurant with terrace. Situated in the centre of the mediaeval town of Obernai, in the former home of the barons of Gail, is the hotel A La Cour d'Alsace. A large entrance with wrought-iron gates leads into the courtyard where the hotel can be found leaning against the old ramparts of Obernai. Exposed beams, half-timbering and works of art provide the backdrop, with rooms being elegantly styled. 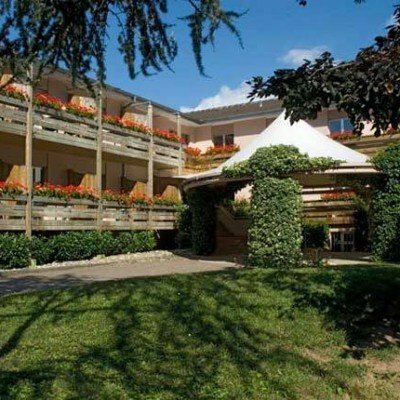 The hotel also offers a wine cellar, a terrace and a spa with a swimming pool and a sauna. For lunch and dinner, guests can choose between the 'Le Jardin des Remparts' gourmet restaurant (depending on the day of the week) and the charming, traditional 'Caveau de Gail' winstub. Room upgrades: Superior Room, Deluxe Room, Privilege Room or Junior Suite. every two days from 11th May 2019 to 12th Oct 2019, for 7 nights. All dates are subject to availability, please contact us to check. Transfers included from Colmar train station at 14:00. Return transfer 5 mins payable locally. Due to the tailor-made nature of our holidays, we need a little more information in order for us to check availability for Wine Villages of Alsace Cycling. Simply complete the form below and a member of our sales team will contact you (when it's most convenient for you) to provide availability information, travel options and an accurate price. Of course there's no obligation, but if you do wish to proceed with a booking they will be on-hand to assist you throughout the process.